Hey guys welcome Friends as you all know that there are few days left in the beginning of IPL 2018. 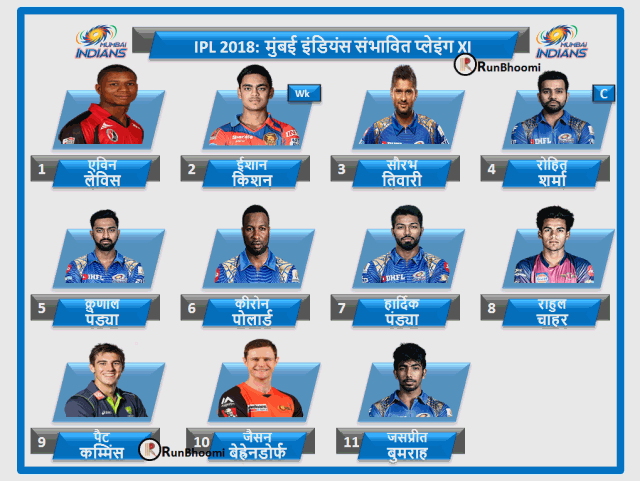 So in this news we are going to tell you about the expected playing 11 of all the 8 teams for IPL 2018. 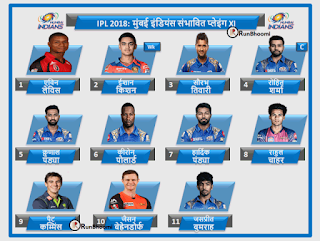 Expected team Mumbai Indians for IPL 2018. Opener: Evin Lewis and Ishan Kishan. Middle order: Saurabh Tiwari, Rohit Sharma, Kunal Pandya and Kieron Pollard. 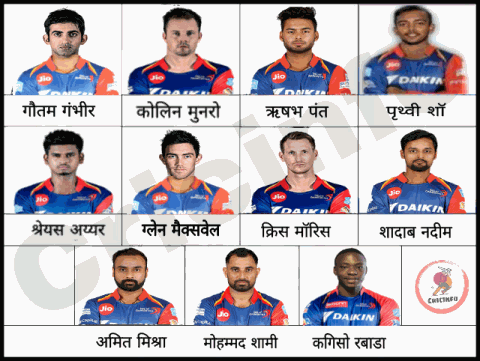 Lower order: Hardik Pandya, Rahul Chahar, Pat Cummins, Jason and Jaspreet Bumrah. Expected team Kolkata Knight Riders for IPL 2018. Opener: Chris Lynn and Robin Uthappa. Middle order: Nitish Rana, Dinesh Karthik, Shubman Gill and Ishank Jaggi. 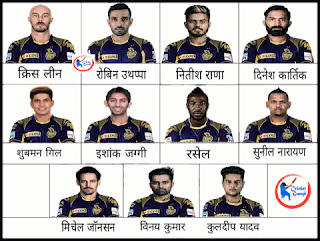 Lower order: Russell, Sunil Narine, Mitchell Johnson, Vinay Kumar and Kuldeep Yadav. 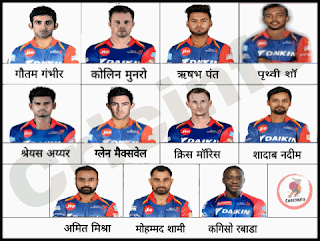 Expected team of Delhi Daredevils for IPL 2018. Opener: Gautam Gambhir and Colin Munro. Middle order: Rishabh Pant, Prithvi Shaw, Shreyas Iyer and Glenn Maxwell. Lower order: Chris Morris, Shadab Nadeem, Amit Mishra, Mohammad Shami and Rabada. 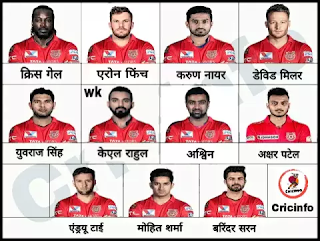 Expected team of Kings XI Punjab for IPL 2018. Opener: Chris Gayle and Aaron Finch. Middle order: Karun Nair, David Miller, Yuvraj Singh and KL Rahul. Lower order: Ravichandran Ashwin, Akshar Patel, Andrew Trai, Mohit Sharma and Barinder Sran. 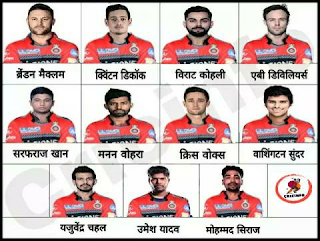 Expected team of Royal Challengers Bangalore for IPL 2018. Opener: Brendon McCullum and Quinton de Kock. Middle order: Virat Kohli, AB de Villiers, Sarfraz Khan and Manan Vohra. Lower order: Washington Sundar, Chris woakes, Yajuvendra Chahal, Umesh Yadav and Mohammad Siraj. Expected team of Chennai Super King for IPL 2018. Opener: Sam billing and Faf du Plessis. Middle order: Suresh Raina, Mahendra Singh Dhoni, Bravo and Shane Watson. Lower order: Kedar Jadhav, Harbhajan Singh, Ravindra Jadeja, Deepak Chahar and Shardul Thakur. 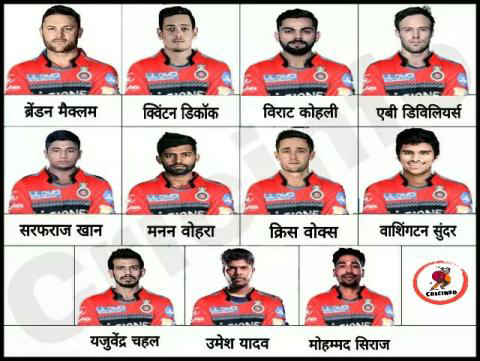 Expected team of Rajasthan Royal for IPL 2018. 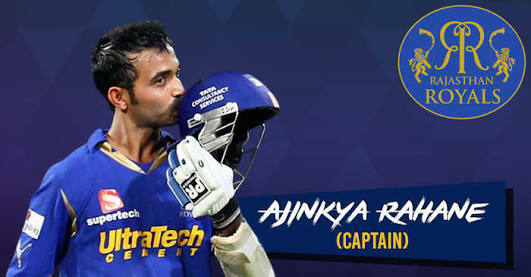 Opener: Ajinkya Rahane and Sanju Samson. Middle order: Heinrich Klassen, Jos Buttler, Ben Stokes and Rahul Tripathi. 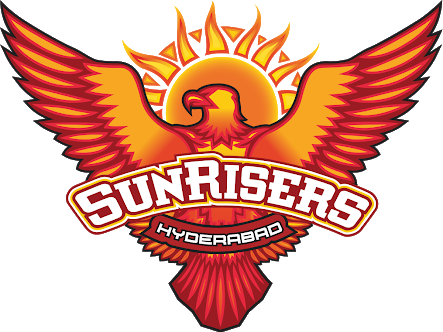 Lower order: Dhawan Kulkarni, Ankit Tiwari, Jaidev Unadkat, Anureet Singh and Zaheer Khan Paktin. Expected team of Sunrisers Hyderabad for IPL 2018. Opener: Shikhar Dhawan and Wriddhiman Saha. Middle order: Ken Williamson, Manish Pandey, Sachin Baby and Shakib Al Hasan. Lower order: Carlos Brathwaite, Rashid Khan, Bhuvneshwar Kumar, Basil Thampi and Sandeep Sharma. 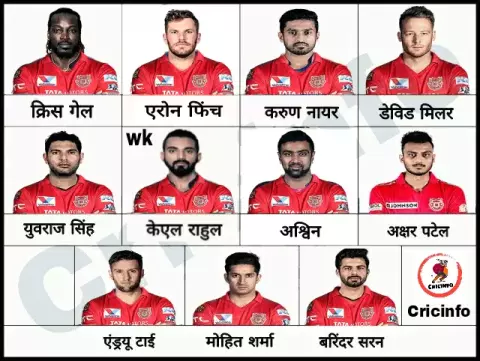 So friend, In your opinion which team is better for IPL 2018. tell us in comment section.